What is a Healthy Bra? A healthy bra is a design with no underwires stays, gel or padding that combines comfort, support with elegant styling. Giving you a garment that makes you feel and look your best while directing your breast tissue properly. • Takes pressure off diaphragm for easier breathing. The “healthy” part is reinforced through the findings of a Professional Postural Therapist. We know the body to be designed to allow for a multitude of functions to keep us alive, moving or standing on two feet. However, lifestyle, diet, profession, repetitive motions etc. all contribute to how well the human frame is supported in gravity. The more stress on the frame, not properly offset by functioning postural muscles allows for a slow collapse forward and down. This affects the proper functioning of the spine (bones, muscles and nerves) the communication network (nerves), the body’s energy and waste removal systems (blood and lymphatic circulation and the body’s life force (the breathing mechanism: the diaphragm). Weak structural support is epidemic. We usually think that stress is only connected with work. In fact, body stress causes show up not only in our food, the air we breathe, and water we drink but ladies have additional stress as a result of ill fitting bras, which do not support the breast, neck, and shoulders. Back pain can be attributed to a lack of support. The same engineering that holds up the Golden gate bridge in San Francisco has been used in the Beauty bra since 1959, providing a healthy alternative for women who want maximum support and a fashionable appeal. • POOR AND LIMITED OXYGENATION OF THE BODY. Who knew these things could have any relationship to a bra? We are not recommending that women wear bras if they do not need to (yes this is a website that sells custom fitted bras) we are speaking to the hundreds of thousands of women who wear them who could receive awesome benefits that come with being fitted properly and bringing your body into a more positive postural alignment. NO the healthy bra is NOT being recommended in lieu of addressing the muscles that support the frame. It assists specially since the breasts have no muscle and rely on the chest and back muscles and the chest ligaments for support. Gravity is not going away! Working against the pull of gravity is HARD work. When your body is balanced within the line of gravity the stress is amazingly offset. Most people have not felt this for a very long time. It isn’t just the individuals breast size that changes the general breast size has been increasing over time. The secrete of the design is the banderine shelf that positions the breast tissue while also enhancing proper postural support, enhancing circulation and lymphatic support. This is a HUGE breakthrough in garment design. It is NOT what it is doing!. It is what it is NOT doing. This garment does not inhibit the body’s natural processes. One key element to mention is the body’s ability to remove toxins through the lymphatic system. It has been well researched, that trapped toxins within the body contribute to a host of health. concerns. But did you know that trapped toxins add to a sluggish internal environment, a poor functioning system and the body holding onto waste that should be able to relinquish? This is only part of the constitution of excess body weight. When we think of being overweight, we think of being over fat. That is only part of the picture. Many overweight individuals carry a great deal of excess in the form of fluid, toxins and other waste products that are NOT just a matter of Fat loss but a matter of regaining HEALTH and the proper functioning of this human machine-the body. Yes, your choice of BRA affects this weight maintenance system through its tie to a proper functioning immune system. The Beauty Bra ( formally Jeunique ) are healthy and attractive. Our bras are designed to position the breasts halfway between the shoulder and the elbow, which is what clothing designers intended. Yours clothes will look and fit better giving you a more feminine and flattering look. The lift prevents health problems caused when breast tissue rests on the chest or stomach. Your posture will improve as you cannot slouch in our bras. In order to get the maximum benefit from your bra, it must be properly fitted. The Beauty lace bra is available in 174 sizes from 30A to 46KK and in three colours, Black, White and Beige. In 2011 we added another style called the “Smoothie which is a similar design but made with Satin fabric and lace trim. Hugely popular also and it is softer to wear. I still recommend the lace design for the larger cup sizes as this fabric will never give out; it has to be worn out! Our custom fitted Bras are unlike any bra you have ever worn. These bras have proven to last three to four times longer than any bra on the market. Switching to the Beauty Bra (Jeunique) is like giving up a floppy pair of slippers for an orthopaedic shoe. It can take a few wears to get used to the uplift and snugness, but once women adjust they are life-long customers and never want to wear anything else. 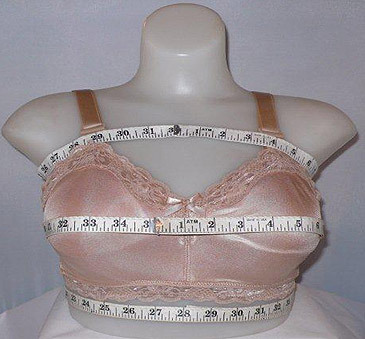 To measure for your Beauty Bra cup size. With an inch tape take the three measurements shown below. The difference between the top measurement and the middle one will indicate the cup to your fitter/supplier and the bottom measurement will give the width around that is required. Pull tape up firmly to a natural stop and write down each measurement in inches. This illustration is shown on the new “Smoothie” bra which is seamless and is made with beautiful satin feel fabric. Comes in White, Skin, and Black. Email your measurements and I will give you an estimate of your cup size in the Beauty Bra.